I absolutely love Mod Lacquer. She has so many gorgeous colors that I could spend hours trying to narrow down which ones were my favorites. When she started to release her new linear holos my jaw dropped. 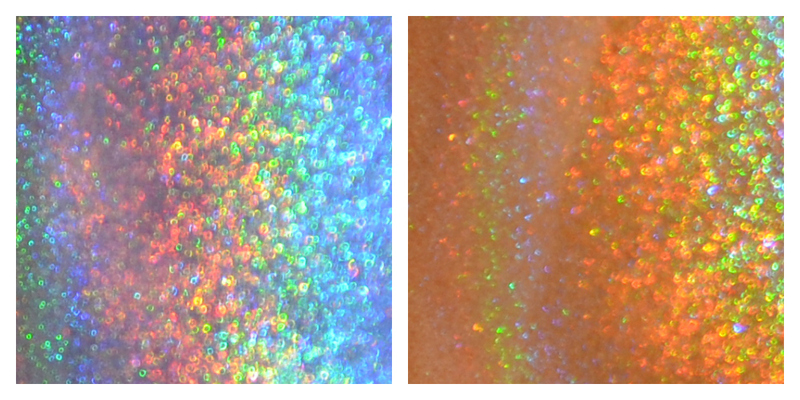 There are so many different holo shades that I've never seen before! Today I have the pleasure of sharing two of those colors with you. I could bore you with repetitive descriptions, but I would rather get all that info out in one go. Both formulas were wonderful to work with, and required 3-4 coats for best coverage. I found that thin coats prevent any signs of streaking in the formula. The colors were just as lovely inside as they were out in the sunlight. I hope you enjoy these drool-worthy holos as much as I did! I was truly wowed by both colors, and would love to pick up the rest of the linear holos by Mod Lacquer. There is certainly something for everyone in this collection. High Strangeness and Interstellar Artifact are available at Mod Lacquer's Etsy store. * Colors were provided for review. All opinions are my own. Both of these are gorgeous! I really like High Strangeness a lot. Those sun shots though, my gods. I really love Mod Lacquer and always wonder why I don't own more. They have a great formula, are packed with pigment, and are lovely. They should be a brand at the top of the indie battle.